There have been a number of startups that have tried to create a social network for neighborhoods and communities, including OhSoWe and DeHood. But there isn’t one platform that has been able to be the go-to social platform for local neighborhoods groups. 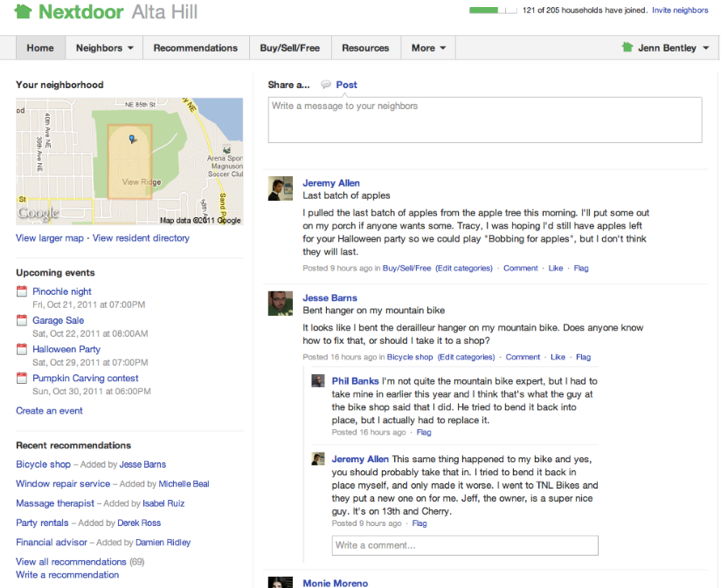 Enter Benchmark-backed Nextdoor, the next startup to throw its hat in the social network for neighborhoods ring. Nextdoor, which is a private social network for neighborhoods, was co-founded by Nirav Tolia, of Epinions fame. After Epinions (which became Shopping.com), Tolia spend time as an EIR at Benchmark, and then co-founded FanBase, a directory of all things sports. Now Tolia is on to his next project, Nextdoor, which is launching to the public today, after being in private beta for the past year. On Nextdoor, neighbors create private, Facebook-like websites for their neighborhoods where they can ask questions, get to know one another and exchange local advice and recommendations. Topics of discussion are as varied as local events, school fundraisers, plumber and babysitter recommendations, recent crime activity, upcoming garage sales or even lost pets. Unlike an email listserv or other online group, neighbor posts are organized and archived for future reference. vouch for a neighbor by inviting them to their website with an email, flyer or postcard invitation. Information shared on Nextdoor is password-protected and cannot be accessed by those outside the neighborhood or found on Google and other search engines. Via a map for each community, you can see which of your neighbors have joined and who has yet to join. Users can find other neighbors in the resident directory, view a neighborhood map, ask for advice, exchange local recommendations, and share neighborhood information with each other. Neighbors can choose to see and respond to updates via email, or only on the website. Tolia believes there is a huge opportunity in trying to solve the problem of connecting neighborhoods and communities for the greater good. He explains that most communication is done via email or phone, and there is a need for a private, communications platform for each local neighborhood. Nextdoor raised an undisclosed amount of funding from Benchmark Capital and Shasta Ventures. Gurley and Shasta Venture’s Jason Pressman serve on the board of directors, along with outside board member Rich Barton, Chairman and Co-Founder of Zillow. Ed Everett, Nextdoor’s senior city strategist and the former City Manager of Redwood City, has been working in city administration for a number of years. He says that at the neighborhood level, there was no appealing offering to create an online community for neighborhoods. He believes that because of Nextdoor’s private, geographic-focused nature, the network is the ideal platform for communities. Over the past year, neighbors in over 175 neighborhoods across 26 states established Nextdoor websites with the goal of creating more connected and safer places to call home. Tolia says engagement was high among users and the platform received positive responses from members.